With technical assistance from the United States Agency for International Development – Advancing Philippine Competitiveness (USAID-COMPETE) Project, BEDAG initriated the formulation of the BIPDP that would address the goals set for the province. USAID-COMPETE provided capacity building support and technical advise to the BEDAG-TWG between February to November 2014. 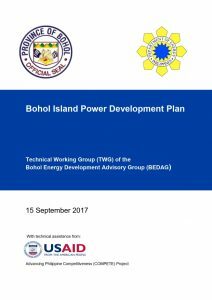 Last November 2014, the BEDAG-TWG presented the Bohol Island Power Supply Plan (BIPSP) to the BEDAG. It was adopted and endorsed by the bEDAG to the Provincial Development Council, where it also received positive feedback. Revisions of the Power Supply Plan shall be done (if needed( with the integration of NGCP’s Transmission Development Plan and the three (3) Distribution Development Plans — completing the BIPDP. The BIPDP shall then, be endorsed by the Provincial Government following public consultations. 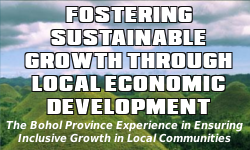 It will be updated annually taking into consideration the future economic activities in the Province such as tourism growth, infrastructure developments, etc. Figure 1. Demand Forecast for Bohol Island (2014 – 2043). Load Forecasts. In 2013 the Island of Bohol had a total demand of 67 MW, approximately 87% of which was normally sourced outside of Bohol through the Leyte-Bohol transmission line connecting the island to the main Visayas Grid. With rigorous forecast model formulation and testing for forecast validity and accuracy, the BEDAG-TWG was able to come up with the demand forecasts shown in Figure 1. The conservative forecast shows that the Province of Bohol will have a total demand of 64 MW (53 MW Baseload and 11 MW Peak) in 2015. Note that the apparent decrease in demand from 2013 and 2015 can be attributed to the effects of the 2013 earthquake. 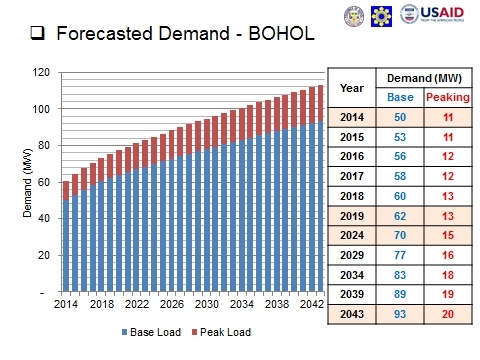 Beyond 2015, Bohol’s demand is expected to increase to a total of 75 MW in 2019 and 113 MW by 2043. Optimal Power Supply Mix. Using the load profile of Bohol and relevant power plant and cost data from representative baseload and peaking power plants, the BEDAG-TWG was able to come up with an optimal power supply mix that, when implemented, will ensure the least-cost power supply. For the combined requirements of the whole island of Bohol, the optimal power supply demand (in MW) should consist of 82% baseload and 18% peaking power plants. Practically all of its energy requirement (99.5%) shall be supplied from Baseload plants and only 0.5% shall be supplied from Peaking power plants. From these results, it can be concluded that contracting for baseload plants should be a priority. On the other hand, since the proportion of energy to be drived from peaking supply is very small, it may be sourced from WESM. Figure 2. 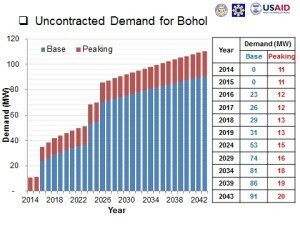 Uncontracted Demand for Bohol Island (2014 – 2043). Power Supply Requirements. 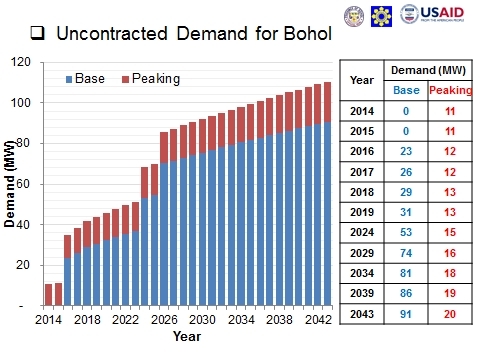 Using the results of the load forecasts and the optimal power supply mix, together with data on existing power supply contracts of the three Distribution Utilities, the BEDAG-TWG projected the total power requirements of Bohol up to CY 2043 shown in Figure 2. Power Supply Strategy. In order to address the impending power supply requirements, the BEDAG has approved and endorsed the immediate contracting of short-term baseload power supply for the years 2016-2018 and long-term baseload power supply for 2019-2039 though a competitive procurement process similar and in conjuc\nction with the transparent and competitive joint procurement process being done by the Electric Cooperatives in R1+CAR and Region 8. Concurrent with bilateral contracting of baseload power supply, the bEDAG will also undergo local resource assessment to identify possible natural resources taht can be utilized for power generation. Increasing the power supply sourced from within Bohol shall contribute to self-sufficiency and climate resiliency of Bohol’s power supply. The BEDAG has also endorsed the transmission plan presented by NGCP where an alternate Cebu-Bohol transmission link shall be provided to ensure connectivity of Bohol to the main Visayas Grid. This alternate transmission link will also allow export of excess power from Bohol if more generating resources are developed with the island. The BEDAG has also resolved that all investments in power shall be subjected to scientific study and evaluation to ensure that they will be beneficial to the consumers of Bohol and are consistent with the goals, objectives and plans set out in the BIPDP. good evening. may i know if the bohil island power development plan ( bipdp ) is available for download? 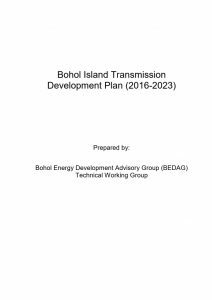 The Bohol Island Power Development Plan (BIPDP) is as of the moment still being formulated. We have referred your message to the people in-charge on the matter and advised them to communicate with you. is it possible that i can ask or have a load curve in dauis bohol,? or the power consumption in kWh only in dauis bohol in year 2015, if possible monthly consumption in year 2015,? thanks. It may be possible to obtain the data you require, however, we don’t have custody of such data. You might want to inquire to the Bohol Electric Cooperative I (BOHECO I), who has jurisdiction in supplying power to the Municipality of Dauis. You might be able to reach and obtain contact details from the BOHECO I Website. I am ​Ann from Citicore Power, Inc.
Our company, CITICORE POWER, Inc. (CPI) engages in the development and operation of Renewable Energy Plants. Responding to government’s thrust and call for an accelerated RE development and sustainability, CPI committed in its pipeline a supply mix composed of Solar, Run of River and Biomass Plants. CPI currently operates three Solar Power Plants: Next Gen Power Technology (Bataan), Silay Solar Power and First Toledo Solar Energy (Cebu). CPI aligns itself with the Energy Industry’s mandate to provide continuous electricity supply to 90% of the country’s households by the year 2017. Cognizant of the opportunity to provide Renewable Energy technology systems – both traditional and hybrid, to grid connected areas and off-grid islands, CPI seeks out potential partnership with Distribution Utilities and Electric Cooperatives to deliver reliable and sustainable electricity supply. Pursuant to this common goal, the CPI Business Development team hopes to meet and present with BEDAG to formally introduce our team and discuss possible partnership opportunities for power plant investments that are aligned with Bohol Island’s power development plan. I would appreciate if we can get the contact person specifically for power project investments.